Last weekend Fuzz and I dropped some cookies off at a bake sale. Because Kathryn, bake sale coordinator extraordinaire, had asked us to tag the cookies with twitter handles or URLs, I was hoping maybe someone would get back to me with a cookie review. And someone did! A few hours after dropping off the cookies I got an email from Lisa at Buttery Books requesting the recipe for my peanut butter cookies. After a little getting-to-know you email chat, we perused each others’ blogs. Lisa liked my cookies and I appreciated Lisa and Annie’s huge collection of book club recommendations and recipes. I told Lisa she could have my peanut butter cookie recipe if I could have a recipe from her site. Her recommendation was a recipe called Kelly’s Sugar Cookies which are soft frosted sugar cookies. Kelly, daughter of Annie at Buttery Books, thinks these are the absolute best sugar cookies in the world. Because I couldn’t resist trying a cookie named “absolute best”, I made a half batch this afternoon. The cookies are soft, dense, and fat and pretty much geared for people who like their sugar cookies that way. I can think of a lot of people, frankly! I tend to prefer really crispy and light sugar cookies when eating them unfrosted, but since I like my frosted cookies slightly soft, these were perfect. 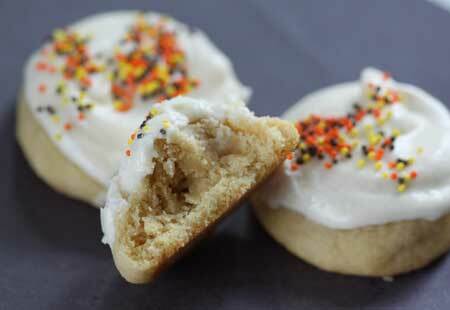 Easy soft,dense, scratch sugar cookies topped with a vanilla frosting. In a large mixing bowl using a hand-held electric mixer, beat the shortening and sugar until creamy. Add egg, syrup and vanilla; beat well. By hand, gradually add flour mixture until blended. Shape dough into balls and roll in sugar OR leave plain if using frosting. For flatter cookies, press the dough down. For fat rounds, keep the cookie dough in balls. Bake for 8-10 minutes, depending on size and thickness of dough balls. Be careful not to over-bake. Cool 2 minutes, then remove from cookie sheets to cool. To make the frosting, beat the sugar and butter together with an electric mixer. Add milk as needed (starting with 1 1/2 tablespoons and working up) and continue beating until creamy. Beat in the vanilla. Anna, I am glad you got a chance to try the sugar cookies and Robin, I am excited you got rave reviews about them! Hey Robin! Thanks for the review. I liked them, Fuzz loved them, but I wasn’t sure what others would think since people have very definite opinions on sugar cookies. I’m so glad your friends liked them. These are amazing! Got rave reviews today when I took them to a gathering with friends. Definitely my new favorite iced sugar cookie recipe. I’ve never had a plump sugar cookie before. I know crisco is suppose to make cookies awesome. I’m still a thinner sugar cookie lover, especially the Christmas sugar cookies! I love that these cookies have maple syrup in them!! The cookie recipe is certainly different. I’m thinking I’ll try it, dip the tops in some sugar and coarsely ground nuts, then flatten them a bit. Maybe it will get me closer to the cookie I’ve been trying to copycat. I think I could find a few people that would really enjoy these too, but I’m with you Anna, I won’t turn my back on the Secret Ingredient cookies :). I’ve never seen cookies eaten as fast as those :). @Holiday Baker Man — Crisco/Shortening tends to produce softer cookies. Crisco? Really? They sound mighty good though. I like your autumn colored sprinkles! Those are my kind of cookies!! You had me at Crisco. Wow! These sugar cookies look yummy. I love a recipe called Grandma’s Sugar Cakes and the picture of your “plump” iced sugar cookies reminds me of them. What a great treat idea!